As most of my followers on Twitter already know, I’ve been playing around with my new toy the last couple of weeks: a Trimble Juno SB GPS, running ArcPad 8. So far, I am very happy with my decision to buy this unit. It has been some work to get to know the ArcPad software, and there are a few things I think it will do, but haven’t figured out yet. However, I am surprised at how much it can do. The Juno and ArcPad have both exceeded my initial expectations. 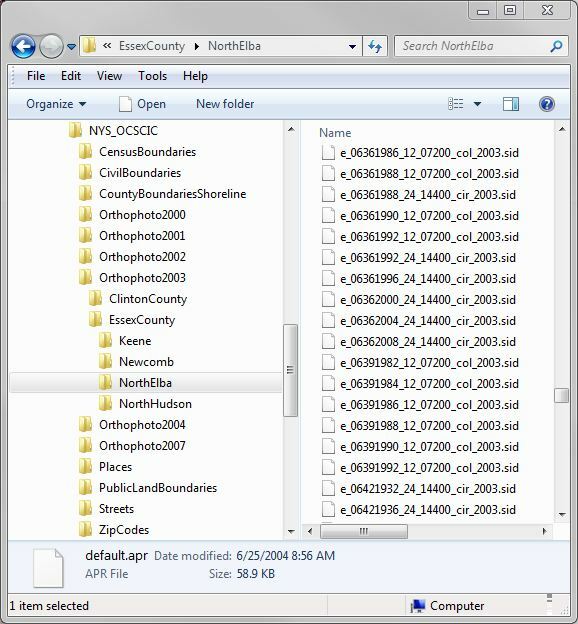 How can I use NYS Orthophotos in ArcPad? 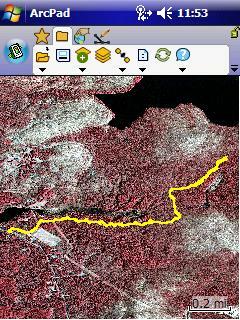 In my GIS work, I make extensive use of the NYS orthoimagery supplied through the NYS GIS Clearinghouse website. I want to be able to use these aerial photos during my fieldwork. 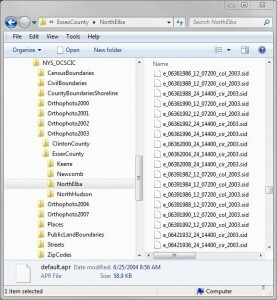 The orthophotos are supplied in MrSID format, and can be easily added to an ArcMap document using the supplied Raster Catalogs. But here’s the problem: ArcPad can read MrSID rasters, but cannot make use of the Raster Catalogs. How do I decide which tiles to load into ArcPad? This aerial photo covered an area of ~6 square miles. At a resolution of 300 DPI, the JPEG output was ~6MB in size. I hope this information is useful to somebody else. I’ve read through the ArcPad documentation, and have been searching through forums and blogs, but have not run across this procedure anywhere else yet. I intend to do some more tests using higher resolution orthophotos, higher DPI JPEG output, and other output formats. I’ll let you know how I make out in future posts. If anyone else has a better solution than this, please let me know. I’m always open to suggestions. 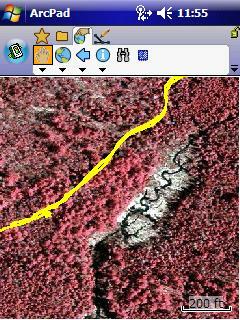 This entry was posted in GIS and tagged ArcPad, Orthophoto on January 24, 2010 by Don.